It is a federal judicial tradition for the sentencing judge to consider every convicted person as an individual and every case as a unique study in the human failings that sometimes mitigate, sometimes magnify, the crime and the punishment to ensue. The facts of a given case remain the most important factor driving the possibility of prison vs. probation. Nationwide from 1993 to 1997, about one white-collar defendant was sentenced to prison for every two convicted, according to the Transactional Records Access Clearinghouse, a group of researchers at Syracuse University. Various factors in the guidelines give prosecutors leeway on how to charge such as deciding which charges to bring. There is also discretion in which cases to bring, and which to leave for state authorities. Federal sentencing guidelines tend to dictate, based on the amount of loss lower level telemarketers might have caused, what sentences they get. One rip and tear defendant was sentenced to 10 years in prison following his conviction by a jury. A number of the ringleaders of major operations have received sentences that have gone as high as 14 years though in one case a principal received a sentence of almost 20 years. Many federal judges also apply the Bail Reform Act to prohibit telemarketers from engaging in any form of telemarketing while pending trial. Additionally, all convicted telemarketers are prohibited from engaging in any form of telemarketing during their period of supervised release or probation. Money laundering is also a frequent tool in pre-indictment bargaining. Prosecutors may tell the target of an investigation that if he agrees to plead guilty, the prosecutors will limit the indictment to mail fraud. If a prosecutor finds a defendant's help to be substantial, the prosecutor can make a motion noting that fact. Without that motion, the judge has no authority to reduce the offender's sentence. In some cases, prosecutors demand that the information lead to the conviction of another person. (3) additional crimes add units to the base, so that punishment will be greater for those who commit more crimes. The rules in this Part seek to provide incremental punishment for significant additional criminal conduct. The most serious offense is used as the starting point. The other counts determine how much to increase the offense level. In order to limit the significance of the formal charging decision and to prevent multiple punishment for substantially identical offense conduct, this Part provides rules for grouping offenses together. Convictions on multiple counts do not result in a sentence enhancement unless they represent additional conduct that is not otherwise accounted for by the guidelines. In essence, counts that are grouped together are treated as constituting a single offense for purposes of the guidelines. The goal of federal sentencing guidelines is so that the same conduct yields the same punishment. Once a point total is determined, judges must sentence the defendant within certain fairly narrow bounds. To address fraud cases involving mass marketing or sophisticated concealment techniques and crimes that impact large numbers of vulnerable victims, the United States Sentencing Commission adopted an amendment providing for increased punishment. Estimates of the combined effect of the amendments will be to increase sentences in telemarketing fraud cases from a current average of 21 months to a minimum of 33 months, representing an approximate 57% increase. On May 1, 1998 (prior to the enactment of the Act), the Commission adopted and submitted to Congress two important guideline changes designed to enhance the punishment for telemarketing frauds and other similar offenses. First, the Commission added a two-level enhancement (on average an approximate 25% sentence increase) for offenses that are committed through mass-marketing which is a central component of telemarketing fraud and distinguishes it from other types of fraud. Second, the Commission added a two-level enhancement (on average, an additional 25% sentence increase) for fraud offenses that involve conduct, such as sophisticated concealment, that makes it difficult for law enforcement authorities to discover the offense or apprehend the offenders. That enhancement also contains a minimum offense level of level 12, which would mean 10 to 16 months imprisonment. The enhancement contained provisions aimed at different forms of concealment such as conducting their operations in locations outside the United States and relocating their schemes to other jurisdictions once they know or suspect that enforcement authorities have discovered the scheme. If the offense substantially jeopardized the soundness of a financial institution and derived more than $1,000,000 in gross receipts from the offense, increase by 4 levels. If the resulting offense level is less than level 24, increase to level 24. Mass-marketing, means a plan, program, promotion, or campaign that is conducted through solicitation by telephone, mail, the Internet, or other means to induce a large number of persons to (A) purchase goods or services; (B) participate in a contest or sweepstakes; or (C) invest for financial profit. Under the Guidelines the defendant's offense level must be increased by two levels if the defendant knew or should have known that a victim of the offense was unusually vulnerable due to age, physical or mental condition, or that a victim was otherwise particularly susceptible to the criminal conduct. If the offense involved a large number of vulnerable victims, the offense level is increased by two additional levels. During sentencing the fraudsters invariably claim that their customers were not vulnerable victims at all. Contrary to that assertion, their "leads" are people specifically identified as willing to send in money in the hope of winning a valuable prize. These people are predisposed to the scam they are running and is the very reason the telemarketers buy "lead lists". The vulnerability of these people is also evident from the reloading process whereby those known to have already succumbed to a scheme are contacted again and again, thereby further honing the original list into a sucker list. The readiness of some people to fall for the telemarketing rip-off, not once but multiple times demonstrates that their personalities make them vulnerable in a way and to a degree not typical of the general population. 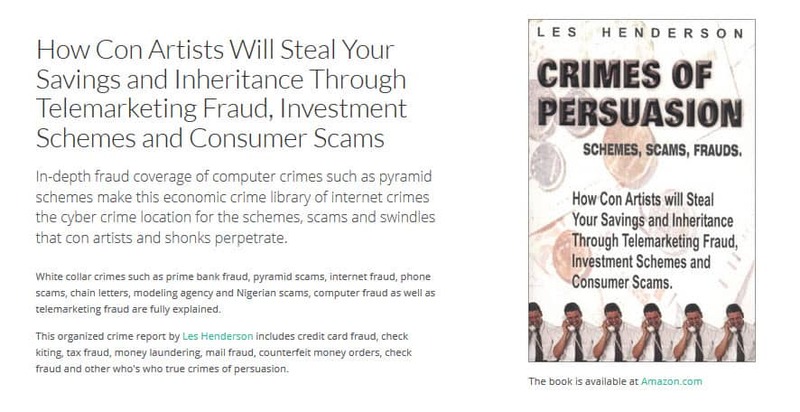 Moreover, the list usually contains the ages of the respondents who, predominantly older, are even more susceptible to these scams. The susceptibility of the victims is a known quantity from the start. Ample evidence usually supports the conclusion that the victims were targeted because they were vulnerable. Some might argue that you can hardly blame these defendants for having the "good business sense" to prey upon persons who were the easiest to victimize. From the standpoint of the over- all financial success of their ventures, the reloading tactic is very efficient and highly profitable. It is clearly the intent of the sentence enhancement, however, to punish such optimizing behavior more harshly. And ultimately it is quite reasonable to punish the "clever crooks" more harshly, both because they may be more dangerous and in order to give special protection to the most vulnerable among us. In cases where a defendant has committed fraud by using a Ponzi or pyramid scheme, taking money from victims and giving part of it to other victims in order to further the scheme, the sentencing court must estimate the actual or intended loss to the victims. While the perpetrator fraudulently obtains the full amount of the "investment," he or she has no intent to keep the entire amount. Indeed, the very nature of the scheme contemplates payments to earlier victims in order to sustain and conceal the fraudulent conduct. The amount of loss for sentencing calculations is calculated by totaling the net losses of all victims who lost all or part of the money they invested. This method takes into consideration the nature of a Ponzi scheme by holding a defendant fully accountable for all losses suffered by those victims who lose money, but does not allow the defendant to fully benefit from payments made to others. It does not reward a defendant who returns money in excess of an individual's initial "investment" solely to entice additional investments and conceal the fraudulent conduct. At a similar Ponzi related trial, the perpetrators used in their defense the testimony from satisfied investors who made money from the scheme by being lucky enough to be one of the first involved. Although the owners did not receive a separate investment adviser's fee, they did receive compensation for providing investment advice so the anti-fraud provisions of the Investment Advisers Act apply to them. This compensation element is satisfied by the receipt of any economic benefit, whether in the form of an advisory fee or some other fee relating to the total services rendered, commissions, or some combination of the foregoing. Telemarketers are not entitled to a credit for cancelled sales for they intend to defraud every victim whose name is on the sales log. That some victims cancel does not affect the telemarketers' intent. They are also not entitled to a credit for refunds, for refunds do not constitute legitimate services but are part of the fraudulent scheme. The occasional refund is merely a cost of doing business. Telemarketers may not inflict all of the loss they really want to inflict, but that is not from any lack of intent. They are responsible for the full reach of their intent, even when that intent was thwarted. They will fail in their attempt to have their offense levels reduced on the theory that at least some of their intended frauds were only attempts because they did not actually succeed in euchring all of their victims out of all of their funds. In one case two factors suggested that the "intended" loss exceeded the actual loss. Some of the victims' checks were returned for insufficient funds because they had no money left to lose. The sentencing court nonetheless subtracted the value of the unredeemable checks from the gross receipts resulting in a "credit" on their sentences. Second, a box marked "no sale" was found full of discarded leads. They intended, indeed attempted to, defraud these prospects as well but it did not count against them either. While many of the victims received some items, it was not what they had ordered. The items, not based upon the wishes of the victims, were "extras" or "gimmies," part of the scheme to "hook" the victims. Accordingly, these items did not provide any value measurable under the guidelines to reduce loss-calculation. Every expenditure - even those that temporarily benefited a recipient - is an integral part of the ongoing, fraudulent scheme. Furthermore, it is doubtful whether any "customer" would value the junk that is actually shipped so the loss figures are calculated by subtracting the cost of the prizes sent from the total money collected from victims during the time periods that they work for an operation even though the defendants maintain that loss figures should be determined by subtracting the value of the prizes awarded, not simply their wholesale cost. This is denied due to the fact that the victims never agreed to buy anything. They agreed to send in "taxes and fees" on "prizes" they had won. The victims believed that they would be receiving something worth substantially more than the money sent in. After all, how could taxes and fees on a prize amount to more than the cost of the prize itself? Thus the loss to victims, in terms of the difference in value between what they expected to receive and what they actually received, was arguably much greater than the money the defendants made on the deal so the court's method of calculating the loss caused to the victims was conservative, reasonable, and quite fair. The 66 year old self-described chairman and CEO of MainStreet Enterprises, began to induce individuals to invest in his company by saying that it was in commercial import-export of such things as cars and cigarettes; that it made substantial profits; and that he would share these profits with investors in the form of interest payments, which would result in annualized returns anywhere from 50% to 1,000%. In fact, MainStreet Enterprises never purchased merchandise in commercial quantities for resale, but only bought merchandise, such as crystal and jewelry, in sample quantities. The money paid to investors as "interest" was simply money that had been received from other investors. The investors put in about $3 million and received back about $1 million before the scheme collapsed. He used the investors' funds to purchase or lease expensive cars for himself and others. He was sentenced to 115 months of imprisonment based on three mail fraud convictions. A telemarketer was sentenced to two years of probation and ordered to pay a $1,000 fine and a special assessment of $100 for his role in an advance fee telemarketing scheme that netted more than $1.1 million. All-Win and A-1 placed nationwide newspaper ads and offered personal loans to persons with poor credit histories. When consumers called the 1-800 number in the ads they were told that they had qualified for the loan program and that all they needed to do was send a fee ranging between $199 and $249 to process the loan. None of the thousands of consumers who sent such fees to All-Win or A-1 ever received their loans. Charged with racketeering conspiracy, money laundering conspiracy and multiple counts of wire fraud stemming from his participation in the operation of nine different fraudulent telemarketing rooms over five years one scam operator was sentenced to a term of imprisonment of 87 months, to be followed by three years of supervised release and ordered to pay $400,000 in restitution to the victims of his crimes. His various schemes included selling advertising products to small companies based upon the promise that the purchasers were eligible to win prizes which never existed; accepting expensive art work from sellers on a consignment basis, which he later stole; accepting fees for auto listings based upon fraudulent promises that a system was in place to match buyers with sellers; and various "bust out" schemes through which he obtained goods on credit from wholesalers based upon phony credit references. The victims of these schemes included private individuals and businesses which marketed various products, including computer equipment, clothing, consumer products and bingo supplies. The owner of a sweepstakes scam was sentenced to the maximum term allowed of 30 years in prison and ordered to repay $8 million dollars in restitution for a telemarketing scheme that bilked more than $10 million dollars from 350 victims throughout the United States. The judge stated: "it is clear that you had no feeling for the victims in this case, who suffered in an extraordinary way" and that "you were motivated by unmitigated greed". Crying, after he made his admission about committing obstruction of justice and perjury, didn't hold any weight with the prosecutor who on 03/31/00 moved for an upward departure from level 12 to level 41, or a sentence in the range of between 324 to 405 months, for Patrick Bennett. When his companies collapsed, they owed about $1 billion to banks and individual investors. The prosecuting attorney stated that the actual losses in the Bennett Funding scam of Syracuse, from approximately 10,000 victims, exceeded $600 million. With only twenty different monetary loss levels, the enhancements stop at $80 million with a 14 level enhancement above a level of six. Sold as leases on office equipment, many elderly victims had the scheme pitched to them as a very safe alternative to conservative investments such as municipal bonds. While many of the leases were fakes; others were real, but were sold to as many as seven different investors. The S.E.C. had determined that the equipment leasing was a fraud and filed a civil case against the Bennett Companies but ultimately they have no criminal powers and little control over people who, like the Bennetts, are not technically in the securities business. Bennett stated "I did not and would not engage in any fraudulent business activity with a criminal intent to cause financial harm or loss to investors of the company." "However, with that said, as a businessman, I do feel responsible for what happened, I was the Chief Financial Officer of the company, and the company did bear my name. And as a person, I feel very sorry and probably as or more sad than even sorry." This sentiment was referred to as an exercise in self-delusion, the vein hope of someone who thinks that no matter how bad things get, something will come and save the day. "He lied about the way in which these leases were marketed to investors. He lied about the way the sham transactions were conducted. And he falsely portrayed a person of contrition on the witness stand, someone who is remorseful." His attorney's suggestion that even Milliken’s or Boesky's sentence, which was only about ten years later reduced to approximately three, did not carry any weight with the judge who felt that insider trading does not have the same dramatic impact on individuals that frauds such as those committed by Mr. Bennett do. One victim stated "This Court represents the tools of justice. You tell us that we should not tear Mr. Bennett limb from limb because the system will take care of it for us. This is as it should be and is how we have order in a civilized society. Revenge is institutionalized and a proper part of criminal law." The judge indicated that one of the most devastating impacts on the investors from this fraud is to see themselves living in near poverty levels while Mrs. Bennett lives on a horse farm built with their money. Her testimony that she never discussed the fact that she took over $500,000 from their joint account and used it to buy property and then build a home without discussing it with her husband, was deemed to be absolutely incredible. The Court felt that assets, including shares in a racetrack, were still under the control of Patrick Bennett, that they were transferred to his wife pursuant to a conspiracy in which he and his wife engaged to defraud potential creditors, so they could not be attached after it was obvious that an investigation was ongoing . Trying not to be insensitive to the fact that sentencing today is real-time sentencing; that years being imposed are real years, and defendants only get one-sixth time off for good behavior; the judge gave Bennett two choices. First, if all of the money were to be turned over and all the assets turned over to the trustee within 30 days, Mr. Bennett would be sentenced to 240 months. However, if the money was not returned he would impose a sentence of 360 months. Such large-scale ponzi schemes, in which early investors are paid off by later victims' money, appear to be on the rise. Investors lost almost $500 million investing in bonds and notes sold by Towers Financial, a failed bill-collection agency run by Steven Hoffenberg who was recently sentenced to 20 years in prison. In other recent cases, the S.E.C. has accused Better Life Club of Washington of preying on low- and middle-income investors who lost about $50 million, and regulators have called the First Interregional companies in New Jersey the "Baby Bennett" case because it, too, involved equipment leases. In court, one boiler-room telemarketer argued that he had no intent to defraud because he was a legitimate salesman who left it up to the owners and managers to ensure that the customers received the appropriate merchandise and one-in-five prizes. Some individuals have devised a simple strategy to avoid detection. They place the fraudulent telephone calls from various motel rooms, always using pre-paid telephone calling cards. They then have victims send their money to private mailboxes rented under various false names. On appeal, one complained that the courts had assumed that 120 out-of-state phone calls to elderly people listed in the records of his calling cards were part of his telemarketing scheme. At sentencing, the government challenged him to present an innocent explanation to rebut the substantial evidence suggesting that the 120 calls were made with the intent to defraud elderly persons. He offered nothing. In one scheme, which resulted in the collection of approximately $1.3 million in less than one year, a telemarketer was convicted for his role as a "reloader" and sentenced to forty-one months in prison. In his appeal he argued that countless legitimate vendors maintain lists of previous purchasers, and that the mere willingness to make repeat purchases does not make a consumer a "vulnerable victim." In this, as in most cases, fronters "cold-called " people from customer lists, which typically consisted of names of people who had filled out contest or sweepstake entry forms at shopping centers. The "fronters" induced these people to purchase pens and other products with promises of significant awards that greatly exceeded in value the purchase price of the products. In exchange for the money, the customer was sent a product and an award. The company typically spent between ten and twelve percent of the money that customers send in on the products and awards. The records indicate that no customer ever received more in value than they sent. At some point after a customer sent in money, a "reloader" received a copy of the initial sales order form (also called "reload paper"), and called the customer again to attempt to "reload" the customer into making another order. The difference between repeat purchasers in general and the "reloaded " victims here, however, is the latter's vulnerability to fraudulent sales schemes. This is what makes them "victims," rather than mere consumers. One scammer claimed that his operation was a legitimate business simply because it was registered with the California Attorney General. It ought to be self-evident that compliance with state registration law is no assurance of a business's legitimacy. Claire Peck, aka Cathy Jackson, was tried on charges arising out of her employment as a salesperson for the Canadian Gemstone Association, which fraudulently marketed gemstones by telephone. CGA marketed the stones as investment-grade gems whose supply was supposedly controlled by a cartel in Colombia and whose value was therefore projected to increase substantially. The evidence at trial showed that Peck and the other employees at CGA made false statements and representations to induce customers to purchase and invest in gemstones at vastly inflated prices. Between 1993 and 1996, over 700 victims paid more than $5 million for stones marketed by them. In June 1997, a federal grand jury returned a 38-count indictment charging Peck and eight others with conspiracy, mail fraud and wire fraud. All defendants, which included BRENT BOYD, AGNES CARTMELL, aka Bea Cartmell, MARK BOYD, aka Joe Prescott, ALBERT MCAMMOND, aka Albert Adams, DAVID BECKLER, aka David Edwards, GEORGE MAZIOTIS, aka Martin Brook, ROBERT ROSS, aka Robert Stevens, HERVE SOURATI, aka Brian Sinclair, were charged in each count. She was convicted on five counts of mail fraud in violation of 18 U.S.C. 1341, and one count of wire fraud in violation of 18 U.S.C. 1343, and she was acquitted on one count of conspiracy, 18 U.S.C. 371 in the United States District Court for the District of Vermont (Sessions, J.). She is to serve concurrent 30-month terms of imprisonment, to be followed by three years of supervised release. The district court also ordered her to pay (jointly and severally with all co-defendants) restitution of more than $4,000,000. She appealed the restitution order (Docket No. 99-1500 Decided: August 09, 2000) but it was ruled that if the court finds that more than one defendant has contributed to the loss of a victim, the court may make each defendant liable for payment of the full amount of restitution or may apportion liability among the defendants to reflect the level of contribution to the victim's loss and economic circumstances of each defendant. Congress broadened the scope of restitution from losses attributable solely to the offense of conviction to all losses caused in the course of a defendant's criminal conduct, whether the defendant is convicted of each of those offenses or not. The restitution statute applicable to members of a telemarketing conspiracy is mandatory and provides that every member of a conspiracy be liable for full restitution regardless of the role that each may have performed. See 18 U.S.C. 2327(b)(4)(A). NEW YORK, 06/15/03 (Reuters) - Forget Disney World, Miami's South Beach or the Florida Keys. For some of Corporate America's best-known bad acts, the Florida destination of choice this year may be a spot just outside Ft. Walton Beach, where they can relax in the sun, make a few phone calls or play an occasional game of tennis or softball. Welcome to Eglin Federal Prison, a minimum security facility where white-collar criminals dress in khaki uniforms, do manual labor and reside in dormitory style facilities. Eglin is the prison of choice for white-collar criminals, who have dubbed the facility "Club Fed." Forbes Magazine once ranked it as the "Best Place to be Incarcerated." The all-male prison has a staff of 143 to oversee about 850 inmates who are eligible for furloughs, can receive visitors and are allowed to make collect phone calls, said Myra Lowery, a spokeswoman for the prison, located on a sprawling U.S. Air Force base. "We have inmates who are nonviolent, who have no serious history of violence or escapes," Lowery said. "We may receive drug offenders, and there may be someone with a number of other crimes that you consider white collar, like mail fraud, bank fraud or tax evasion." To be sure, prison time won't be easy for executives -- even at Eglin, which once allowed inmates to wear their own clothes and have overnight guests. Prison authorities have since removed some of the niceties. "How has it changed? Rules and regulations change," said Lowery, the Eglin spokeswoman. "That doesn't mean it's for the bad or the good." 02/05 - CA - The victims of his telemarketing fraud included a recent widow undergoing chemotherapy treatments for cancer and an elderly woman living on fixed income while caring for her handicapped adult children. On Monday, U.S. District Judge John F. Walter sentenced Kenya Markisha Hutson, 30, of Woodland Hills to 15 years in prison, calling him a shameless "sociopath." It was one of the stiffest sentences meted out in recent years for telemarketing fraud, said Assistant U.S. Atty. Curtis A. Kin. Hutson was convicted by a jury last June on 14 counts of fraud stemming from his operation of E-Med, a front company that he used to steal more than $1.3 million from investors, according to prosecutors. Investors were told that their money would be used to refurbish and sell state-of-the-art body scanners to medical facilities nationwide, including Loma Linda University Hospital and UC Irvine Medical Center. Instead, Hutson used nearly all of the funds to buy a luxurious home and fancy cars, the jury determined. In pronouncing sentence, the judge said that Hutson's testimony during the trial was "smug" and "preposterous" and amounted to obstruction of justice. Defense attorney Michael Evans said he disagreed with the judge's assessment of his client and plans an appeal.